In the new SyFy series "Dark Matter," a crew of six people wake up on a ship, with no memory of who they are or how they got there. 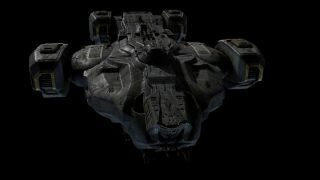 The new science fiction TV series "Dark Matter," is packed full of mystery, and the show's co-creator Joe Mallozzi talked with Space.com about what viewers can expect from the first season. Mallozzi talked to Space.com about the setting for the show, the design of the show's spaceships and some of the cool sci-fi tech that viewers can expect to see this season. An executive producer, co-creator and show runner for "Dark Matter" Mallozzi was also a producer and writer for all three "Stargate" TV shows. He and Paul Mullie co-wrote the comic book "Dark Matter," on which the new show is based. Space.com: "Dark Matter" is a show that's built on the premise of not knowing — the characters don't know who they are or why they're all on board a spaceship together, and we're given very few details about the world they live in. Without spoiling too much, what can you tell me about this world that "Dark Matter" takes place in? Joe Mallozzi: The world we created is a world in which multinational corporations have transformed into multi-planetary [corporations]. They're the ones with the money, so they're the ones that are able to build the ships. They're the ones that are able to go out and colonize space, essentially to find planets in order to exploit their planetary resources. And so the big players in colonized space are these massive corporations with their own fleets. There are certain independent principalities that they have no control over, and officially they can't look like they're strong-arming these people, so they use other means to get what they want. They're very powerful and very wealthy, so they can find technical ways around the law. So this is kind of the shark pool our crew is swimming in. SDC: Another theme brought up briefly in the pilot and in some of the teaser material is whether these characters good guys or bad guys. Can you talk about that a little bit? J.M. : Ever since I was a kid, growing up, I always liked the bad guys. I always found the good guys kind of dull. And when actors come in to audition for roles, they always ask to play the bad guys, because the bad guys are the most interesting. And I think deep down we can all relate to the bad guys and essentially the freedom they have to do whatever they want. Or, on the other hand, the fact that everyone in their life has done something they regret. You know, it's silly to slot people into these black and white categories. There's a lot of grey, and you're on the grey spectrum. Very light grey or very dark grey. I just like the idea of taking these individuals who have gone down a certain path, and suddenly they're presented with an opportunity to change. This is a do-over for them. And we explore the journey of these six characters as they undertake this — [to] either redeem themselves or start new lives. And like in real life, some are going to be successful, [and] some will fail. SDC: One of our favorite things about any space-based show is the spaceships. In the pilot, we see two: the large space ship that the crewmembers wake up on, and a smaller shuttle within that ship that's meant for things like landing on planets. What were the design ideas behind these ships? J.M. : Just in terms of a general look, I wanted [the large ship] to be compact, so it almost looks like a little bully, like a little bulldog. And that's to suggest maneuverability and quickness, and yet sort of an underlying ferocity. And I wanted it to look sort of beat up and suggest that it had been through its fair share of battles. So it has some battle scarring and the like. It's a tough little ship. It looks like it could take on a ship three times its size because it's quicker and more maneuverable. SDC: So, in this universe, ships can travel faster than light (FTL), and so far it seems like the whole universe is open to exploration. In some of the press photos, we see an image of some kind of space station. What is that? J.M. : The idea is that they're way stations for travelers going from point A to point B in their spaceships. We've actually come up with something kind of interesting that we introduce later in the season, something called "transfer transit." [In the show] there's FTL travel, but even with FTL travel, it's still going to take you a while to get somewhere. And we got around that in "Stargate" using these things called stargates, which allowed almost instantaneous travel from anywhere in the galaxy, but that's something we didn't have in this show. So each station has its transfer-transit room, kind of like a Starbucks. And you go in and you basically choose your destination. You get into a pod, and your body is scanned. And the information is essentially sent via subspace to a receiver station wherever you want to end up, say on the other side of the universe, instantaneously. And once the information is relayed over, that information is used to create a clone. And basically it's a clone built with your physical specifications and essentially a template of your mind is downloaded into this clone. SDC: So information can travel instantaneously but not people? J.M. : Yeah, basically we're saying that you can send messages via subspace. And so it's informational. That's pretty much how the stargates worked — travel via wormhole — and it's kind of the same way. You're unable to travel, but you know information packets can [travel], and in this case data is able to be sent over long distances. The tagline for the transit company [is] "better than being there." Of course. there are issues, right. Like I said, the clone body only lasts 24 to 48 hours, so you have to get back to your receiver pod before your time is up so that the memories you made while you were traveling can be uploaded back into your original body — because if you don't, then basically the clone is destroyed and those memories are lost.